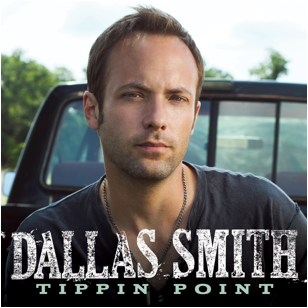 NASHVILLE, TN (October 8, 2013) – Hot country newcomer Dallas Smith is revved up for the exclusive premiere of his high-octane single “Tippin Point” on SiruisXM’s The Highway today, 10/8. The song is now available at iTunes and will be featured on his forthcoming full-length album. The elastic-voiced singer brings a fresh slant to country, a wall-of-sound approach that combines the vocals of country with the crunch of rock. Produced by Joey Moi (Florida Georgia Line, Jake Owen) and written by Florida Georgia Line’s Brian Kelley and Tyler Hubbard along with Jaren Johnston, “Tippin Point” is an infectious party anthem that serves as the perfect prelude for what is to come from Dallas. With energetic live shows and compelling tunes, it’s no surprise that Dallas, who fronted the wildly successful international rock band Default, has been tapped to open for music legend Bob Seger and is currently touring with Florida Georgia Line’s HERE’S TO THE GOOD TIMES TOUR. Hailing from British Columbia, Dallas brings a healthy dose of rock and roll power to his brand of lively country music. Producer Joey Moi captured his unique energy and unmistakable vocals on his breakout Canadian country debut, JUMPED RIGHT IN, which netted five 2013 CCMA award nominations. The CMW Radio Awards winner has once again teamed up with Joey Moi for his U.S. country debut on Big Loud Mountain.